Saarbrücken, Germany, 15 July 2003 — AbsInt Angewandte Informatik GmbH has been awarded a 2004 European Information Society Technology (IST) Prize, the most distinguished award for groundbreaking products that represent the best of European innovation in Information Society Technologies. 420 innovative projects from 28 countries competed for this year's Prize, among which 20 winners have been selected. The selection criteria were: Technical excellence, innovative content, potential market value and capacity to generate new jobs. The award-winning product is AbsInt's aiT WCET Analyzer, a software tool helping developers of safety-critical applications to verify that their programs will always react fast enough. The aiT WCET Analyzer is the first automatic tool for ensuring the correct timing behavior of software in safety-critical systems. 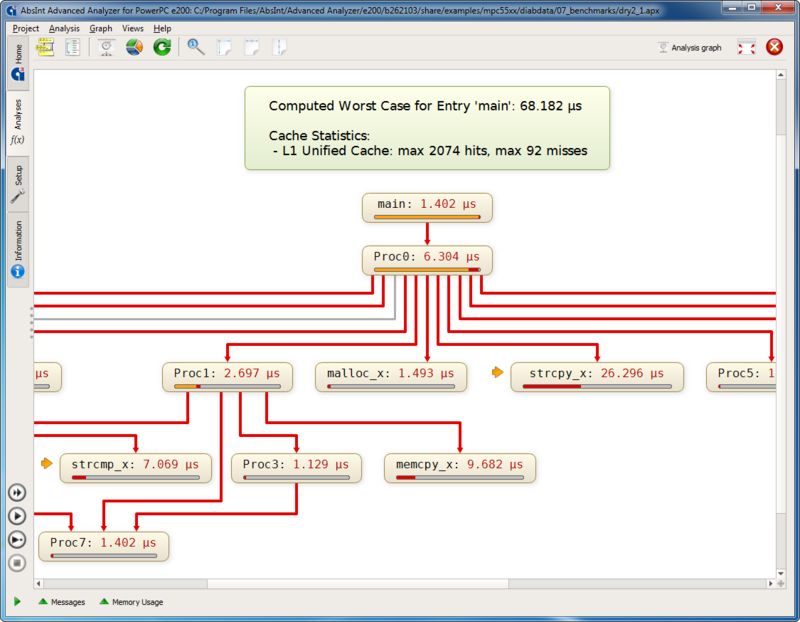 It is based on statically analyzing a task's intrinsic cache and pipeline behavior. This enables correct and tight upper bounds to be computed automatically for the worst-case execution time (WCET). These bounds are valid for all inputs and each task execution. The aiT WCET Analyzer can replace the widely-used but error-prone and time-consuming methods based on time-stopping, thus contributing to enhancing system safety. There is no longer any need to measure execution time over and over again. The computed bounds reflect the actual performance of the system. Safety-critical systems can be designed more cost-effectively. For more information, visit www.absint.com/ait. AbsInt Angewandte Informatik GmbH provides sophisticated software products and advanced services in the areas of compiler optimization, static program analysis, and worst-case execution time prediction. Founded in 1998, AbsInt is a privately-held company located in Saarbrücken, Germany. For more information, visit www.absint.com/profile.htm. Since its creation in 1995, the European IST Prize is the most distinguished award for groundbreaking products that represent the best of European innovation in Information Society Technologies. With a total prize amount of EUR 700,000, international recognition and huge interest from investors, the European IST Prize is the most coveted of the prizes recognizing major achievements in the IST world of today. The European IST Prize is organized by Euro-CASE, a European non-profit-making organization of the national Academies of Engineering, Technologies and Applied Sciences from eighteen European countries, with the sponsorship and support of the Information Society Programme of the European Commission. For more information, visit www.ist-prize.org.